I don’t normally do the photo challenges, however here are two photos from Italy. 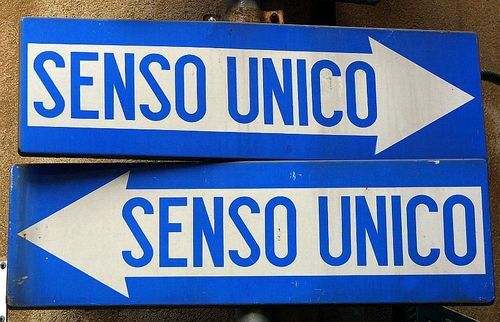 Italians see road signs and traffic lights, as advisory rather than obligatory. But it doesn’t say, no entry except residents, it is a one way street!! Pecora, it doesn’t matter, my apartment is just up the street. I have lived here 15 years and I always turn left up here. This photo was taken in Calabria. 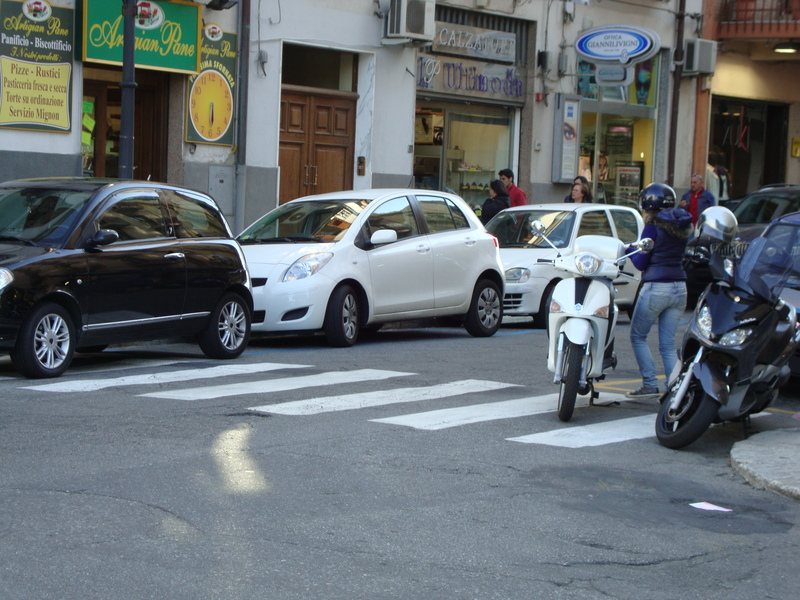 When you come to Italy on your holiday, please do not use the zebra crossings when you want to cross the street. There are a number of reasons. 1) You will annoy the car drivers who use them to park there cars. 2) They are very dangerous, no really they are. As you start to cross the road, you will be thinking you are safe and the car will stop for you. I am here to tell you, it is not so. The driver is thinking, mmm pizza today, I had better phone my mum and make sure she has put the beer in the fridge. He will not have even noticed you, not unless you have long legs and a short skirt. And even then he will still run you over. When I moved here, I drove Mrs Sensible’s car from the UK to Italy, I took the scenic route and drove through, Belgium, Switzerland a bit of Germany… I didn’t have one near miss or accident. Two weeks after arriving here, I stopped at a zebra crossing in Alessandria, to let an old guy cross the road. The old guy never moved he just stood there and watched the Ford Transit Van redesign my boot and bumper. This post is for the WordPress Weekly Photo Challenge. lol, Great Info for my “someday” trip to Italy. Driving In Serbia or crossing the street… not so difficult. But the rules are like those for the English language. always exceptions. I dragged my Colleague into a passing taxi and we made a run for it. Driving is safer, it is much safer to be sat in a car than walking along the pavement. As a general rule, the further North you go the better the driving, but there are some exceptions to the rule. Florence is like driving in the UK, lots of speed cameras and nearly everyone behaves. Naples is utter mayhem, think of stock car racing without the rules. P.S. How’s the diet going? Are you still hanging in there or have you succumbed to the grappa? I went to a cafe’ on Saturday lunch time and had one or two aperitifs (tequila based) If you order drinks from this bar they always bring you a mixed platter of cheese, meat and bread. The cafe was quiet, so when the owners friends turned up, he grabbed a bottle of grappa and sat at a table with them. I was supposed to be finishing my espresso and then going, but the temptation was too great so I slugged the espresso, and walked to his table with my empty coffee cup. Like a gentleman he filled it with grappa. You will. People watching is great over here. They are everywhere, but nobody takes a blind bit of notice. I need to go and step on the old weighing scales, the problem is I was very naughty at the weekend, I might upload the pics of my cocktail and food. Well that’s cycling out too then! I am still laughing … I mean really laughing with tears in my eyes! I remember those pedestrian crossings so well! Even after I returned to NZ, it took me some time to adjust to the fact that everyone here always stops at the pedestrian crossing without giving it a second thought … I used to wait for cars to move while they waited for me to cross! But one thing is for sure – even with all their disregard for rules, or because of it – Italians make you laugh -:)! Providing of course one survives! To live in Italy you either have to look at the funny side of life, cry and bang your head on the wall or move abroad. I love it here. I no longer stop at pedestrian crossings, because the car behind won’t stop and even when I do stop, anyone waiting at the crossing just looks at you with suspicion, and won’t move until you have driven away. I love it here. My next move will be to Sicily. Growing up in Oxford in the 1950’s and 60’s we never used the official crossings, we just walked through the moving traffic. Jaywalking was a local sport, I think it may have been due to the University students having a similar attitude to the Italians. I hardly ever use the designated crossing in our local market town; I have been driven into twice (slowly thank goodness) and much prefer taking my chances further up the road. Many years ago, when I was on a coach tour in Italy the driver had umpteen “special arrangements” (usually involving someone boarding the coach and leaving with an envelope) about using tiny local roads and we never had far to walk to our destination! The elderly ladies on the trip gave him huge tips at the end of the week so he probably still made a profit. I love the Italian ethos and your posts about surviving it. I get the feeling that a lot of agreements (allegedly) are made with little envelopes or a favour that is repaid later. Italy is a fab place, just a little disorganised, but the weather is to die for. I loved this post – particularly your take on pedestrian crossings.This calls for the green cross man, remember him? He wouldn’t survive long in your neck of the woods. Here neither, come to think of it: crossings appear to be put their as decoration, or maybe to help camouflague passing zebras. ikkk! “put there” not “their”, and “camouflage”. Cue linguistic hair shirt. never spotted one spilling misstake. Don’t worry, you are at home here. Bad PN. Very bad PN. The green cross man would be as flat as a pancake and Tufty the Squirrel would be road kill. There was a great UK TV ad for home safety, when I was a sprog. It featured a boy and his cat called Charlie. The cat would meow away and then the boy would translate for it by saying “Charlie says never cross the road without looking both ways..
Mrs Sensible is catwoman? 😀 I’m a green cross man girl myself. I had a look at those hedgehogs singing the Beegees, it’s good! How’s things with Mr Cretino? Miss civil servant tol me not to worry because even if the piece of paper says that it expires after two moths, the police know that it’s really four months at the moment. Hmm. B****r. “told” and “months”. There are no moths in this story, except in my appplication form. You are getting a tad stressed, with your spelling. The worrying thing is I didn’t spot one mistake when I read it. It’s my job to check spelling, which is why I check my own. But after I’ve hit “send” it’s not much use. What can I say about Mr Cretino? mmm idiota, stupido, see how he has helped me to improve my Italian vocabulary. It is a pity I am no nearer obtaining an Italian driving licence. I should say your post was very entertaining. The photos are perfect! But I thought the Americans drove very carefully ! Apart from Dukes of Hazzard and the A team. You have policemen who hide behind billboards and men on motorbikes who chase baddies (Chips). Anyway come and rant any time. You will get on great with Mrs Sensible. She should have been a policewoman. Hmmm, must be similar in Portugal because I have stopped for pedestrians waiting at a crossing and they have actually waved me on. When I went to Rome I daren’t even cross the road. Another reason I love Italy but dare not live there! It sounds the same. In the beginning, I would stop at the crossings and I would be waved on, I used to resist looking in my mirror, because I knew the guy behind me would be looking daggers at me and shacking his head. Sounds a lot like driving in Montreal. Except that we DO stop at red lights. Cars might stop at a red light to see if the road is clear, but if nothing is coming they just drive through. My uncle in Sicily just toots his horn and drives through stop signs. I have never driven in Rome, Napoli was bad enough. I was trying to weave in and out the traffic while Mrs Sensible was removing my watch and my Tom Tom. I thought she had gone mad, we nearly had a domestic at a set of traffic lights. She was shouting at me, this is Naples, they will smash your window to steal your watch and Tom Tom, listen to me…. Yes, we were told to dress down when visiting Naples. A quick visit to grab a pizza and we were straight out, never to return! I would love to go for a weekend, but I can’t convince Mrs Sensible. I was in Rome last year, and I almost had a heart attack every time I crossed the road! Luckily I had no close-encounters or missteps, however I will be Italy again this summer… hopefully I’ll make it out alive! Do you know how Venice is on this front? I have only been to Venice once, you get about by foot or boat. We went during the carnival, but there are thousands and thousands of tourists you are literally heel to toe with everyone. Five of us walked in a single file with one hand on the shoulder of the person in front to make sure no one got lost.. Honest!!! Northern Italy it not too bad so go and enjoy it. I faced death many a time in Rome! It doesn’t help that some of the zebra crossings are huge, making imminent death almost inevitable. I saw so many accidents (admittedly, none of them serious) in Rome and was so lucky not to be involved in one. Frankly, I’m surprised that you’ve lived long enough over there to write a post about it! I am still alive because I stay away from zebra crossings. In the UK a car will stop at a zebra crossing and wait until the pedestrian has completely crossed the road before moving. In Italy cars just drive around anyone on a crossing, normally without slowing down. Very funny! We just returned from a week in (north) Italy, where we drove, so I feel I can relate to this post now! We were often told to ‘follow the signs’ to various places only to find the signs often ran out. We once saw two signs to the same place right next to each other but with totally different distances on them. I also love how the red traffic light is at least twice as big as the others in Italy, as if to reinforce a point. However I have to say that Italians are still better drivers than the Germans. I bloody hate German drivers. what comment can I leave for you PN, it’s ALL TRUE !!!!!!!! And I thought Americans are all nutty drivers. Compared to Italy we have a “picnic” driving. It is mad here, as soon as an Italian gets behind the wheel of a car, he changes. Some of the nicest people I know, do a Jekyle and Hyde as soon as they grab hold of the steering wheel.